Programming equipments with AT89LP devices in the field without any PC. This small stick adapts direct to our USB Programer Stick. A software allows you to download bin or hex files (for the target AT89LP equipment) to this Field Programmer. You just connect this adapter to the AT89ISP connector of the target equipment. If the button is pressed this adapter will flash your equipment with the new software. This is ideal if you have to change System configurations in the field. No PC and no user knowledge needed. This design supports the AT89ISP Cable 10-pin Male Header Pinout. 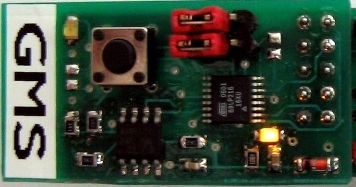 A picture of our USB - Field Programmer PCB prototype.